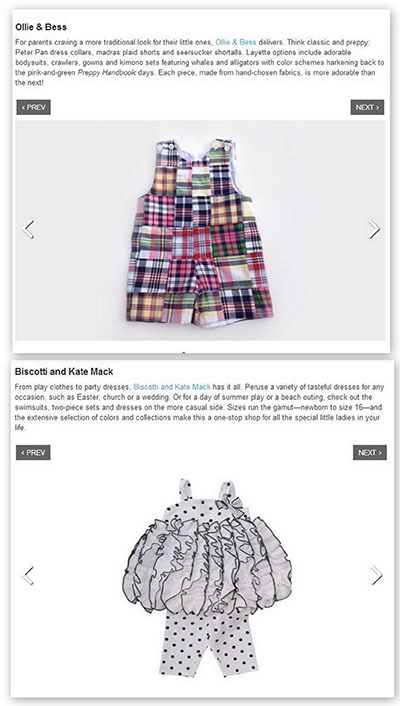 Congratulations to our Clients Ollie and Bess and Biscotti and Kate Mack for their feature on Daily Parent, in which they were included inÂ the roundup of cutest online boutique brands for kids. Ollie & BessÂ is home to traditional childrenâ€™s clothing built with the worldâ€™s softest material in adorable, covet-worthy patterns. From gators to bunnies and crabs, Ollie & Bess has the sweetest patterns for this spring. Their classic lines, simple sophistication and irresistibly soft feel make them the perfect choice for celebrating lifeâ€™s little moments. The designs in the Biscotti and Kate Mack collections possess a nostalgic and modern appeal destined to please both the youngest customer and the fashion conscious young teen.Â Whether the occasion calls forÂ a formal or more casual look, the combination of beautiful fabrics with eye-catching details fills the need for what girls (and Moms) want an outfit to be: hip, but also simple, pretty and modest.